On 22nd September 2004 HE Sotirios of Korea cosigned on the contract-paper for the 7th Orthodox Church Building's construction work in Ulsan, Korea with the Seo-Ahn Construction Co., which will be on its work schedule from 1stOctober, 2004, through 15th June 2005. St. Dionysios (the Archbishop of Aigina) Orthodox Church in Ulsan will be the Seventh Orthodox Community in Korea after the Communities of St. Nicholas(Seoul), of the Annonciation of Theotokos(Pusan), of St. Paul(Incheon), of The Assumption of Theotokos(Jeon-Joo), of St. Andrew(Palang-li), and of St. Boris(Choon-Cheon). The total cost of the construction project of St Dionysios Church Bldg. (4,932 Square) in Ulsan is US$690,000.00 (770,000,000 won). 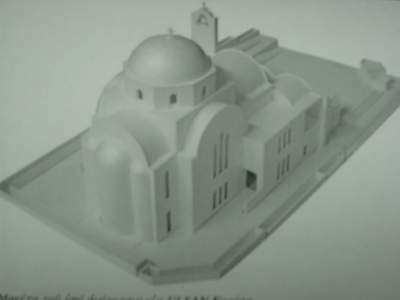 This Building Construction Project of St. Dionysios Orthodox Community in Ulsan, which will be remembered as the Seventh Church in Asia as recorded in the Book of Revelation, was initiated a year ago when the Hyun-Dai Construction Co., contributed a land property to the Orthodox Church in Korea with the basic value cost, as a token of their appreciation forthe cooperation of the Orthodox Church in Korea through the New Ship Blessings of the Company's Products conducted by the Orthodox Clerics.